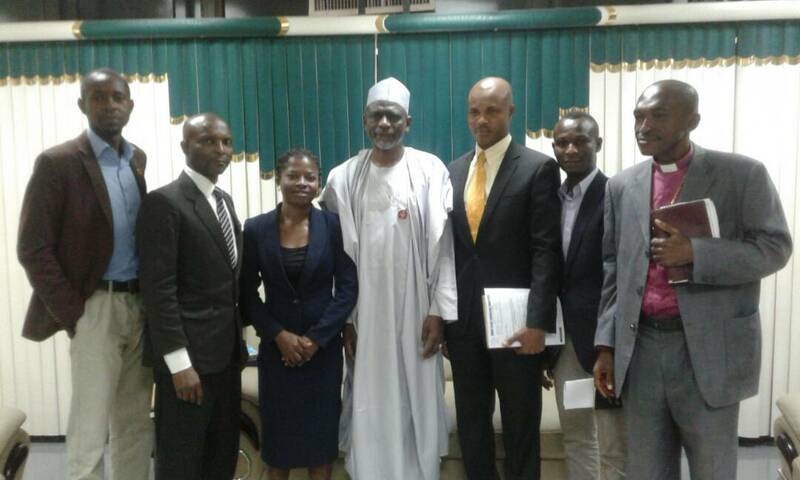 Beloved in Christ, we had meetings with the Honourable Minister of Education on Christian Religious Studies in Nigeria based on the letter from Federal Ministry of Education dated 25th of August 2017 = = (Please the paragraph two of the letter from Federal Ministry of Education says = “I wish to inform you that, the decision at the NCE meeting in Kano (July 2017) stated that Christian Religious Studies (CRS) and Islamic Religious Studies (IRS) are now two separate subjects in the Curriculum and copies of the separated Curriculum will be made available to schools soon.” = By Federal Ministry of Education.) = Please photocopies of relevant documents attached. = Please the meeting started by 12:30 pm with an opening prayer by Pastor Bennett Ezekiel of the El Shaddai Joyful Church Mpape Abuja. Beloved in Christ please I wish to inform that during our meeting with the Honourable Minister of Education of Federal Ministry of Education that the Honourable Minister Confirmed that the Christian Religious Studies has been Separated and is now a full Subject and is in the School Curriculum and has been circulated to all the schools in all the villages in Nigeria. Beloved in Christ, the Missionary Bishop said to the Honourable Minister of Education that what prompted our meeting with him is this = “The Separated Curriculum will be circulated to Schools Soon” = that we are not comfortable with the word “Soon” = Please it was then that the Honourable Minister of Education assured the Christians in Nigeria that the Separated Curriculum has been circulated to all the schools in all the villages in Nigeria. Beloved in Christ please the Honourable Minister of Education expressed his joy over the peaceful nature and positive attitude of Christians in Nigeria. Beloved in Christ please for your special offering for the work of Jesus Christ. = Any Zenith Bank of Nigeria Plc = Acct Name : Mount Olivet Evangelical Ministries = Acct No: 1012232357 = Please we appeal to your Church for Financial Assistance for our Evangelism and missionary work in West Africa and God shall surely reward your church exceedingly. Amen. 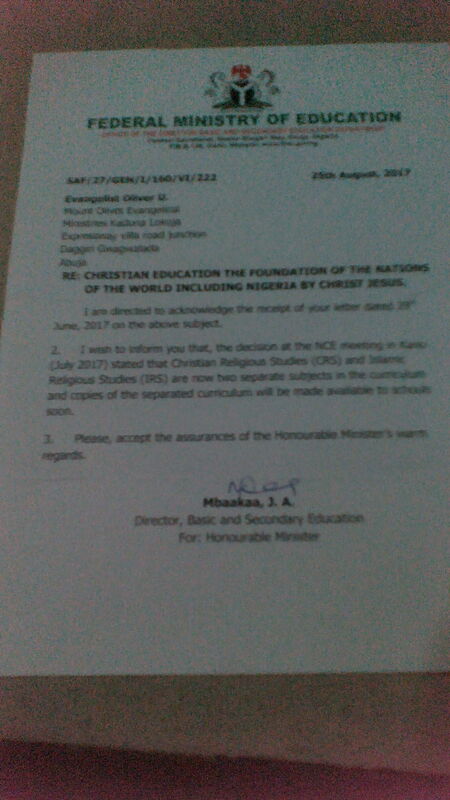 Beloved in Christ I hereby wish to inform you and the church committee of your church the letter we wrote in respect of Christian Education removed from school Curriculum to the Honourable Minister of Federal Ministry of Education dated 29th June 2017 and the reply from Federal Ministry of Education dated 25th August 2017. = Please photocopies will be made available to you on request or visit our office. Beloved Calvary greetings to you and your family and your staff. Beloved my heart desire and prayer to God is for God to continue to prosper our dear nation Nigeria and give us everlasting peace. Amen and Amen. Beloved Christianity is Love and Peace and Prosperity hence Christian Education is the foundation of all the nations of the World by Christ Jesus which includes Nigeria. Beloved friend please God said you should return CHRISTIAN EDUCATION as full Subject and to the school curriculum without alteration before the end of Thirty Days or face the Wrath of God and Judgement of death upon you and your family and Die a shameful death within Seven days and those that are part of the decision will partake in the Judgement of Death. Amen.